A hand-tied arrangement of the freshest blooms and foliage from the Chelsea Flower Market. Snapdragons, lilies and pink roses wrapped in raffia in the French style. This arrangement is cut to fit in our cylinder glass vase (included with your order free of charge). When you're looking for a thoughtful, tasteful gift with modern, mature style, you want to give something that expresses your loved one's style while showing how much they mean to you. Whether you need a gift for a birthday, anniversary, special occasion or as a sweet romantic gesture, nothing offers elegance and adoration quite like a beautiful flower arrangement. 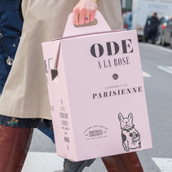 Ode à la ROSE specializes in stunning bouquets with a chic, modern touch. You'll find handcrafted, high-end arrangements in the gorgeous French style for every occasion. If a natural bouquet with a touch of sweetness is what you're searching for, our Pink Market Bouquet is perfect for surprising your sweetheart or brightening your loved one's day. 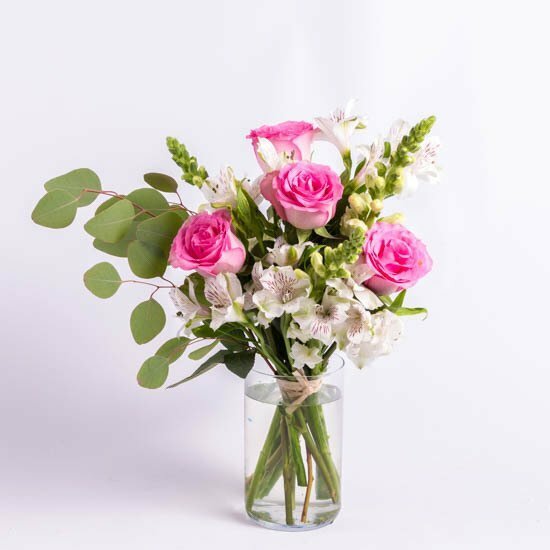 A hand-tied arrangement of snapdragons, lilies and pink roses wrapped in raffia, this beautiful bouquet contains the freshest blooms and foliage from the Chelsea Flower Market and is cut to fit in our cylinder glass vase (included with your order free of charge). 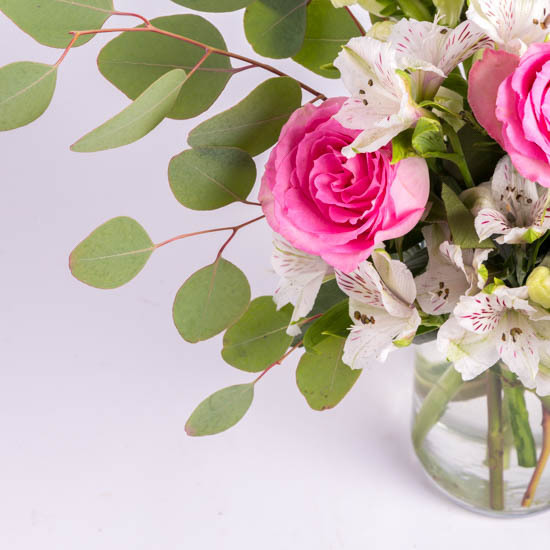 Send a Tabletop Treasure Hand-tied and delivered in a lovely glass vase, our Pink Market Bouquet is the perfect gift to delight a loved one and add a flair of chicness to their desk or countertop. Their sweet-smelling package will arrive in a fun and unique gift box that's as stylish as the bouquet inside. 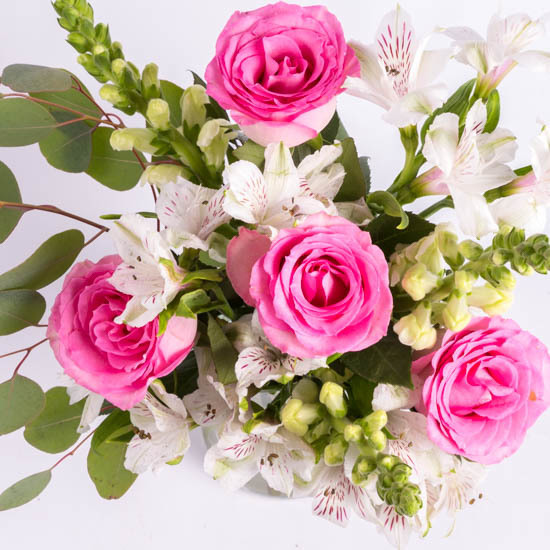 Enjoy Elegant Style and Texture Composed of a delicate, eclectic arrangement of classic pink roses, stunning snapdragons and lovely lilies offset by fresh eucalyptus and foliage, our Pink Market Bouquet makes a beautiful combination of natural, soft colors and aesthetic variety. Your recipient will adore the multitude of textures and fragrances this modern but elegant arrangement brings. Enchant With Ode à la ROSE Specializing in in-house, handcrafted, high-quality bouquets made from the freshest blooms and arranged by expert floral designers, Ode à la ROSE is passionate about presenting the perfect message with flowers. Send some love to someone special with our Pink Market Bouquet today.